I love the slow shift from summer to autumn. One day I’m wrapped up to the hilt, and the next it’s warm enough to expose my skin to the sun and absorb as much Vitamin D as I can before winter. Last weekend we decided to make use of the beautiful weather and walk from Selborne - the home of naturalist Gilbert White - along the Hangers Way and back to Petersfield, nourished by a flask of coffee and two squashed Linda McCartney sausage sandwiches. We were accompanied by the family schnauzer Tinks and Skye, an eccentric collie we were dogsitting for the weekend, who ended up hopping into a cattle trough. Dave and I have lived in this area almost all our lives, but due to our terrible orienteering skills we went wrong as soon as we left the car. 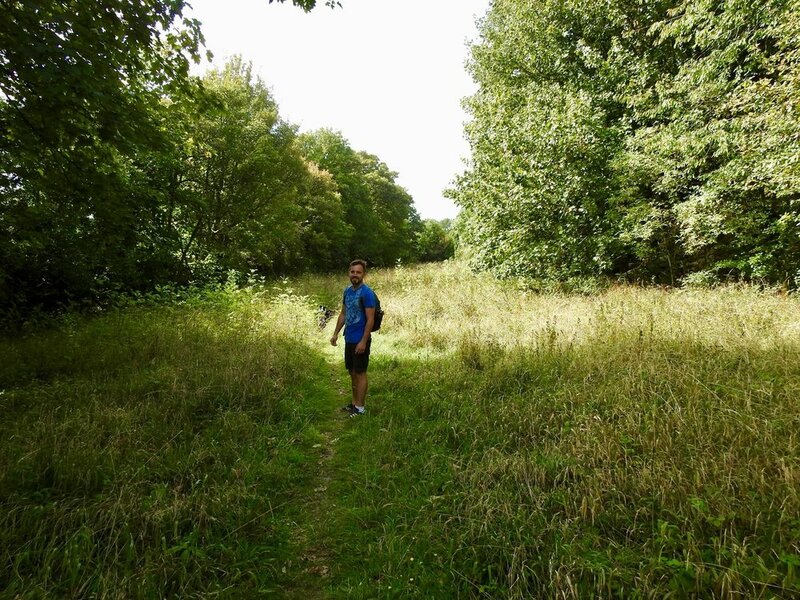 We followed an ‘alternative’ route for four miles, during which we found a herd of deer and were both stung by the same wasp, before somehow ending up at our half-way-house destination of Hawkley. Rather than going on to Petersfield, we decided to find the correct path and complete a circular loop back to Selborne again, a route that took us through a field containing a herd of cows which we skirted tentatively with two tethered dogs straining to investigate. An enormous bull with curly white locks stared at us the whole way round, and continued to do so when I stopped to harvest a glut of blackberries that were too tempting to resist. Dave, Tinks and Skye on guard, I collected as many as I could while glancing over my shoulder at the bull, before we all hopped over a wonky stile and into the safety of the next field. When I’m feeling bored, stressed or drawn towards the kitchen, my favourite thing in the world is making jam. There’s something incredibly satisfying about simmering fresh fruit and sugar until it’s a thick, gloopy mess, cramming it into recycled jars and smothering it over toast. Autumn is the perfect time to fill the cupboard with jars of jam and chutney, one of the oldest ways to preserve fruits and vegetables until the next growing season. This recipe doesn’t use grams or ounces because I make it up every time - instead, it’s all about ratios. There are three ingredients involved: apples, sugar and other fruit. I used crab apples because we found a windfall just outside Selborne, but cooking apples are equally good. Both contain a natural setting ingredient called pectin which helps the jam solidify into something spreadable. For the sugar I use anything I have in the cupboard, but it’s usually granulated or caster as brown sugars can be a little heavy on the tastebuds. You can buy jam sugar in the supermarket which has extra pectin added in. This is quite expensive but good if you don’t want to include apples in your jam, although the taste is so mild I always just use apples. Lastly, there’s the ‘other fruit’ - and this really can be anything you can find that has a good texture. I wouldn’t use rosehips or anything with a stone as jam-making involves using the whole fruit, although these can be used in jelly-making instead. For this recipe, I used fresh foraged blackberries and elderberries, two delicious, vitamin-rich species that are abundant in the September hedgerow. 1. Peel crab apples and chop into smallish chunks, then add to a large pot. 2. Rinse blackberries under cold running water and remove any stems, then add to the pot. 3. Rinse elderberries under cold running water and remove any stems (this can take a while), then add to the pot. 4. Pour 50ml cold water into the pot, stir and turn on the hob to a low simmer. Allow fruit to gently simmer for five to ten minutes and stir with a wooden spoon to help release the juices. 5. Pour in the sugar and stir well until dissolved. 6. Slowly increase the heat until fruit becomes gloopy and the jam starts to bubble. Keep stirring to prevent sticking, but the temperature needs to be high to ensure a good setting point is reached. 7. Keep stirring for as long as needed to create a good gloop, then turn off the heat and pour carefully into sterilised jars (or washed with hot soapy water). Add lids and then write label jars when cool enough to handle. As the jam cools it will create a vacuum and the lids should pop inwards to ensure the jam is airtight.